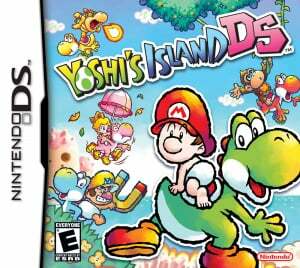 Following a critically-acclaimed title like Yoshi's Island, the immediate question that most will ask after learning the existence of Yoshi's Island DS will be: is it better than the original? 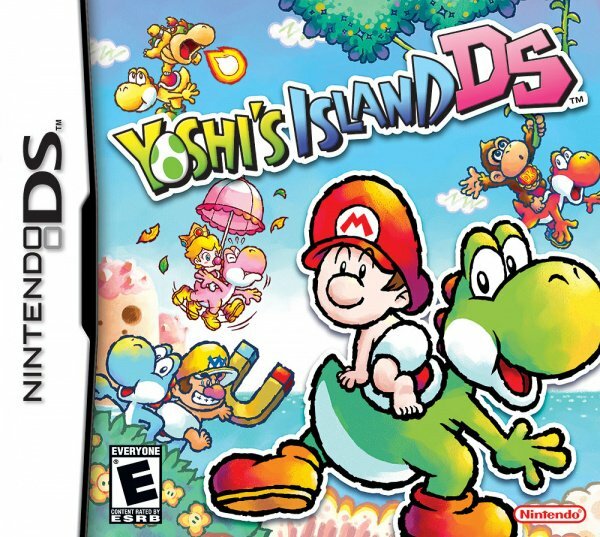 Actually, scratch that: anyone who has played through the sublime SNES platformer will know what the more appropriate question is: does Yoshi's Island DS even hold a candle to the original? After all, this is a decades-after sequel on a completely different type of system, created by an entirely different third-party developer. It's particularly curious for a company like Artoon, who doesn't have the unblemished track record one would expect for a Nintendo property. Quite some time before most gamers even get to take it for a spin, the external traits of Yoshi's Island DS begin to look mighty disheartening. But therein lies the conflict: prejudice and preconceived notions. Should a title be tethered to existing media, or should a reviewer examine every game as an isolated experience? The latter certainly has sound reasoning behind it: if the original Yoshi's Island had never existed and if this version had its Mario license stripped away from it, it would be a very decent platformer. In fact, it could be considered one of the DS's best. Yet we can't ignore the obvious: this is a sequel to the SNES classic. It catches our attention via name recognition and familiarity, and so we naturally respond using the same attributes. On that front, Yoshi's Island DS pales in comparison to the utter perfection of its older sibling. It tries too hard to recapture the same magic that made the first game so beautiful. It's quite similar to the uncanny valley hypothesis: the closer you get to perfectly replicating something, the more people will notice the slight differences between the two and thus be disturbed by the "impostor." Yoshi's Island DS is structured nearly identical to its predecessor, almost to a baffling level: the title screen shows a revolving island, Yoshi dances in place and scratches his chin, baby Mario has the same unbearable whine, etc. It's all here. 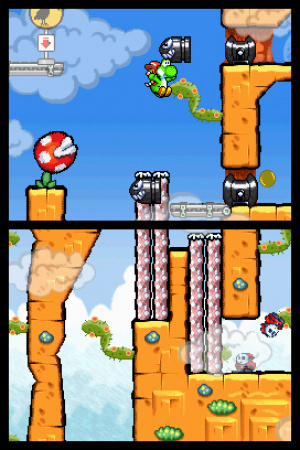 The main differences found in the sequel are the use of multiple characters and the double-screen view. A cast of diverse characters is usually a good thing for a video game, particularly platformers. 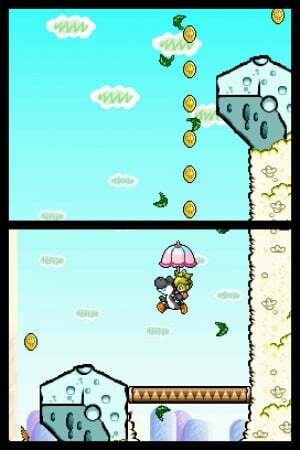 In Yoshi's Island DS, this is done via the use of "stork drops" containing baby-ized versions of a few Nintendo regulars: Princess Peach, Donkey Kong, Bowser, and Wario. 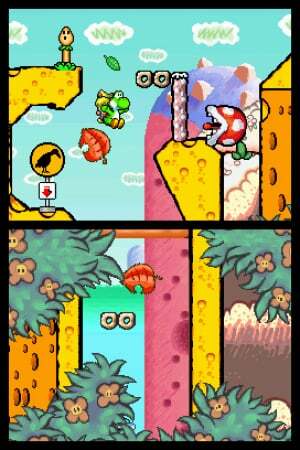 Stationed throughout the levels, the stork will appear and Yoshi can switch out the babies of various skills. Mario can make Yoshi run, the Princess can use her umbrella to make Yoshi float and catch wind gusts, Donkey Kong can climb vines, Bowser can breath fire, and Wario has a magnet (don't ask). While many critics were not impressed by this mechanic, it's certainly not terrible. However, it does seem a bit unnecessary: while the original Yoshi's Island succeeded in part through its varied and creative gameplay, it was the environmental obstacles and not the abilities of the character that made the quest so fun. Also, the stork drops usually appear right before a brief section that requires a non-Mario baby. Yoshi will get the right baby, do the brief section, and then there's no need for that baby and you'll want to go back to carrying Mario. It feels almost as though the sections were stuck in justify having the multiple characters, and the multiple characters to validate having the game in the first place. As stated before, you'll probably find yourself using Mario the most. One minor irk with Mario's running ability is that it's accomplished by holding the Y button. It's a mechanic that feels perfect for standard Mario platformers, but doesn't work quite as well in Yoshi's Island DS: in the SNES original, Yoshi would run on his own without having to hold a button. This left the Y button completely free for tongue-flicks and didn't require the player to alter their pace when doing a tricky series of moves like running, then jumping, then floating, and finally grabbing something with Yoshi's tongue. Additionally, because of Mario's running "ability," it seems as though they slowed down Yoshi's regular walking pace with other characters. This is a bit of a pain when not using Mario. The other major difference is the DS-specific use of two screens. It's not quite a hindrance but similarly never feels right. This is due to the so-called "dead zone" between the two screens. The issue is the amount of in-game space hidden: the difference between the DS Phat and Lite's screen placements means that not everyone will be able have a consistent experience. There will be items hidden in that space which will have most gamers constantly and repetitively searching the space above their heads. Also, aiming between the two screens isn't quite intuitive and many egg shots won't line up as they should. It should be noted though that occasionally the two screens are used in a clever manner that shows traces of SMW2. The "dead zone" concept works better for something like Contra 4: since the player is only moving left to right or bottom to top, shots still line up as you'd expect for vertical-scrolling sections and the space is irrelevant in the horizontal-scrolling sections, since players will usually stick to either the high or low route. Yoshi's Island requires much more active scanning of his surrounding area, something that is complicated by the dual-screen/dead zone setup. Other than these areas, Artoon has expended much effort to essentially "recreate" Yoshi's Island, especially in the audio and visual departments. The graphics are extremely similar, but most definitely not the same. Yoshi's Island DS tries to recreate the Super FX 2-powered spectacles of the original, but it's never quite as impressive as it was 10 years ago. But even if you prefer the graphics of the original, you can at least appreciate Artoon's dedication. The music is much the same: similar to SMW2 but with the feeling of trying too hard to be the music from SMW2. Despite this mostly negative review, the game is solid and should not be missed by fans of SMW2 and/or quality 2D platformers in general (something of which we can never have enough). 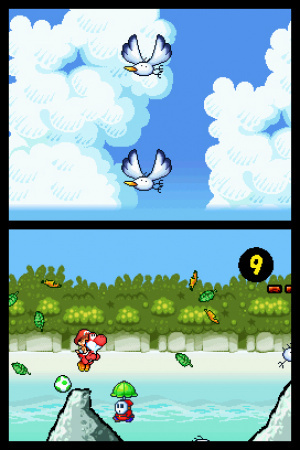 As a stand-alone game, Yoshi's Island DS is an enjoyable platformer. But to compare it to the SNES classic would be akin to comparing Sean Lennon to his father: expecting him to live up to the walrus would be entirely unrealistic. i agree solely to this review i played the SNES Version on my GBA and enjoy it much better then this one i mean the updated graphics are nice but still yoshis island on SNES is by far the better one of yoshis games if not the best i wish nintendo would bring it to VC soon.. I really enjoyed this when it first came out, fair play to Artoon they didn't do such a bad job. The only thing that ruined it for me was the accursed character switching, it just broke the flow of the game and made it needlessly complicated. 7/10 is fair, nice review Kaes. I got bored with this game halfway through. Probably, the best "to the point" conclusion ever! About right. I felt this game had far less stylistic consistancy & integrity than the original. But as Kaes says, still a decent platformer. I have got in trouble on the forum for saying this before but in my opinion this game is a homage to Yoshi's Island rather than a full on sequel to it. I was happy with this game even though it didn't have much replay value for me. I never had a problem with the "gap in the screen" issue and I didn't have a problem with the multiple babies. But having said that, it wasn't as varied as the original and compared to the original and games like New SMB I felt like I was playing the same few levels over and over again. I'd put this one on about the same level as Kirby: Squeak Squad... maybe a touch ahead because of its ridiculously good style. Yeah and I might get into trouble for shooting my mouth of saying I hate this review as a whole! So you just knew I was thinking 7 in my head before I saw it down at the bottom; then I let out my most aggonized groan! But a score of 7 is fairly alright I guess! The thing is that this was my first Yoshi's Island game; & it's my beloved favorite in the series! Also it's one of the best 2D DS games there is; along with Super Princess Peach which also my favorite! Also I think it would only be fair just to add a bit to the review; saying some of the later levels are a tad bit dificult! And why not be specific on how good most of the other Babies are instead basing it solely on Baby Mario?! Baby Peach is the 2nd best in my opinion, followed by Baby DK in 3rd! Wario is cool because; but yes some people will say the magnet is wonky! And Baby Bowser may be just as crude as his grown up counterpart; but his fire breath does come in handy... just he's heavy while slipping in the ice levels! And to me the only real pain you might want to consider talking about is mashing down those DS buttons & pad while playing the game; for you think running was a thing Yoshi is inclined to do IMOA! This game was cool, got it for my birthday. I thiught it was pretty much as good as the SNES game but harder. I played this game first, then the GBA/SNES version. I thought it was very good but after playing the first one it's apparent that they tried to put way too much stuff in the game. I'd like to see Yoshi's Island DS 2 with just Baby Mario and none of the others. It doesn't have the castle music for goodness sake. The music killed this game for me. I just didn't like really this game for some reason. I don't think it's bad but it just didn't feel like it was a genuine Nintendo platformer and instead felt more like a fan project that tried to copy Nintendo but never got it quite right. The graphics looked a bit more garish as opposed the beautiful originals and the dual screen just doesn't work for me in games where they simply spread the view across them both, because of the gap and blind spot in the middle. Yeah, I would say it was ok but nothing special whereas the original is truly one of the best platformers ever made. I have never had a chance to play the SNES version, hopefully it will come out on the VC, and when it does I will download it instantly, but I really like this game. It isn't perfect, but few games are. I would give it and 8/10. I am one of the few who actually like the different babies, and I am glad it isn't a clone of the SNES version, so when I get that one, I won't be bored. The main problem I had with this overall fantastic game is that it was easy for 3/4 of the game, then suddenly BAM! The difficulty hits a brick wall and it becomes very VERY hard. This game is good, but not as good as the original Yoshi's Island. I`m sorry,i had a flashback from the long gone past:) Anyone remembers this guy and the flamewars he was part of? Yeah, I liked the first one better. Still, the second one is good, just not as good. I enjoyed this game, but I agree, the SNES original was just a lot better overall. Bad review, this game comes very close to living up to the original while still feeling fresh thanks to some outstanding level design that takes advantage of all the different babies' abilities. 9/10 at the bare minimum. The music was the major downfall of this game. It's sad, considering the music was one of things I was most excited for when this game was announced. Thank you NintendoLife for reviewing this game. Given how amazing the predecessor was, it's a shame to see this game get such a mediocre score. I almost got it once, but I wound up getting Rocket Slime instead. I think I made the right decision. @accc. I beg to differ. Rocket Slime is amazing. If you've played it, you'd agree with me. Good game. I would probably score it a 7 or 8. What? 32 comments and no-one's nit picking on the last sentance? You people need to listen to The Beatles more. I'm not sure that I agree with your negative stance on the review. You are criticizing everything about the game that deviates from the original. Games should be reviewed on their own merits and not merely compared to the standards of the previous entry. I personally believe the game deserves an "8.5", and the use of different babies is simply ingenious. DK's bomb-eggs, which inflict higher damage with their increased blast radius, were especially helpful in clearing certain boss levels to 100% completion which requires not taking damage during the final battle. Peach's float ability makes it easier to grab hard-to-reach red coins and avoid random pit-deaths. Mario's eggs ricochet three times before they expire, which is good for clearing enemies out of nooks and crannies. Also, yoshi can run faster w/ Mario. I agree that Wario's magnet is a little bit wonky, and he really doesn't contribute much to the game overall compaired to the other characters. I can't comment on Bowser Jr though, as I never made it to the final map (world 4 final boss was too hard, and I moved on to playing other games). The Mario, Peach, and DK gold coins are a nice addition to the game. There is one in every level, and you need that specific baby to reclaim it. The top screen is used in many genius ways, such as viewing/shooting enemies on the ceiling that cannot be reached by normal means, and viewing areas below while airborne, so you don't fall down a pit or onto an enemy. It seemed that the music of every level was a subtle remix of the original tune, and the shaping of the instruments really helps to set the mood on each level. This musical strategy is used in many games and movies, and often can be very effective if the style/beat of the base tune is catchy enough. I traded it in, It comes no-where close to the first one. It's almost as bad as a fan boy remake. If you love the first game, don't even bother with this one. seriously. It's insulting & just a cash in. People had trouble finishing this? I agree once you beat the game the bonus levels are hard but isn't that the point of bonus levels? But world 4? Really? If anything its easier than the original. Oh, and on that note something nobody has mentioned yet. Yoshi's Island wasn't really the same without Touch Fuzzy, Get Dizzy. I know why but... not having that level that was the biggest thing I disliked about this game. It's always looked good to me. But yeah. It's pretty hard to match the perfection that is Yoshi's Island. The GBA version is still my favorite GBA game. I've beat it like 3-4 times. Meh, I found this game kinda uninspired, and with that difficulty spike near the end, I never finished it. It's too bad, really; I'd love to see my favorite Mario character get some good games of his own. This game was nothing but frustrating. They put in the cheap kind of difficulty where you constantly get killed by stuff you didn't know was there. They think it was okay because they gave you a million lives, but it wasn't even remotely fun. I got rid of my copy in short order. "I don't think it's bad but it just didn't feel like it was a genuine Nintendo platformer and instead felt more like a fan project that tried to copy Nintendo but never got it quite right." And that's exactly how I feel about this game. It feels like they just took the original and hacked it with worse sound and visuals. It's a shame Artoon is wasting the opportunity of working on new IPs with the talent of Naoto Oshima (Sonic's creator). Would the reviewer give it a higher mark as a stand alone game btw? 7?!? 7!?! Are you kidding me, that game was great. I think you just hate yoshi. It's OK. I'm not crazy for it. This was one of my first Nntendo games. I was not fortune enough to play the older Yoshi Games, just got the DS version and i found it to be great: good graphics, catchy sounds, good lvl design. Maybe comparing it to the original it looses some shine, but as a stand alone game (as it is) is at least good. Really fun and cute. I love Baby Wario. Dunno why. Imo some people may not check it out cause of the cute graphics, but that aside it's a cute game. I'm just ashamed I'm stuck on a level.... D: I know, I know, lame. The feature to see enemies in a museum is nice. Well I havent played SMW2 and I loved Yoshi's Story despite its shortness and extremely easy difficulty and I loved its cutesy graphics so this game sounds great to me! Unfortunately I can't afford it for a long while with me needing to save for a 3DS and all. I can't understand why everyone is saying this game was worse than the original. I played both the original and this and I think this one is better by a country mile. The graphics, sound, gameplay, everything. Deadzone wasn't a problem, and it didn't even cross my mind that switching babies would be cumbersome to others, I didn't mind it at all. I was deprived of video games as a child, so I don't have very high standards now. Even so, for some reason I can't place, I didn't enjoy this game. I don't know why, I expected to be in love with it, instead I found myself to be very disappointed. I guess I found it boring compared to other Mario games. :/ The graphics were cute though and I loved playing as the different colored Yoshi's. If you actually played the original first and waited for this one you would see that it really isnt as good. It's a good platformer - but it doesnt add anything new to the title and the alternate character mechanic just feels cheap, like they tried anything to upgrade the game. This game deserves 7/10, but the original is 10/10. It's still a great DS game though - and I did like the enemies catalogue. I also preferred the originals graphics. Yeah the original was better, but this is not a bad game by any stretch of the imagination. The original has more nostalgia for me but I still enjoyed this game very much. If the SNES Yoshi's Island is a 10/10 this is a 8.5/10 for me. Thought this was a great game....I see it as being to the original Yoshi's Island what the Jap version of Super Mario Bros 2 (aka The Lost Levels) is to the original game....a much harder version (Yoshi's Island DS get's extremely tough later on and a couple of the unlockable bonus stages seem near impossible) with additional features, but still with most of the playability and charm of the original game. I'm surprised so many people on different forums seem to hate the music in Yoshi's Island DS as well, I think it's excellent. That being said, the original Yoshi's Island is still the better game though...it's level design pretty much is consistently perfect whilst with Yoshi's Island DS, it's just very good....the majority of the time. My biggest bugbear with Yoshi's Island DS is the removal of the inventory system, meaning that there's no way to refill your star counter if you're near the end of the stage with less than 30 stars (forcing you to replay the entire level again) and some of the red coins/flowers/character coins are much more difficult to locate than in the original.